Wendy Cantrell, 45, has just married her steady boyfriend of seven years, Roger, and became Mrs. Sinclair – a respectable wife of a popular architect. They both moved to Houston where he started to work over a big new development, Magnolia Crescent, leaving his wife alone in a house full of chameleons and cockroaches – an isolated newlywed in a strange city, freshly unemployed and feeling more like fish out of water with every passing day. When Wendy’s friend, Paula, phoned her and suggested a long weekend in Las Vegas, Wendy went over the moon. Finally a bit of fun and shopping far from Roger’s new conservative friends and their nosy, conceited, gossiping wives. She went to Las Vegas and never returned. For many reasons. Wendy found Vegas more laid-back than L.A., quirkier than Denver, looser than Houston. In Vegas, irreverence and outrageousness were the order of the day. She loved the wackiness and impulsive energy of that place. Her husband didn’t understand at all. Roger went ballistic but Wendy decided it was her turn to be busy, especially that she got a once-in-a-lifetime chance to work as a real clothing designer, not to mention her Ann-Margret act in the local casino. Was she just in the throes of some hideous midlife crisis, making a complete fool of herself because she‘d lost her job – and her identity – with it? What would become of her marriage and her career? This novel was full of surprises. First of all its main heroine, Wendy, was far from a cliché I expected, judging this book from the cover. She was funny, she liked flirting, shopping and eating out but she tried to be faithful to her husband and she behaved in a far more dignified way than her younger friend, Paula. It is a first-person narration so we get to know a lot about Wendy and her complicated marriage situation. Sometimes her reactions and musings are trite, sometimes poignant but always honest and believable. I do appreciate honesty a lot. The way the plot was developed made the reading interesting as well. It wasn’t the ordinary “a married woman meets another guy and finds the love of her life but it’s already too late” kind. Practically till the very end we don’t know what Wendy’s decision will be. Such hesitancy about the future didn’t feel spurious although I did think once or twice how come a mature woman, knowing a man intimately for seven years, became so undecided all of a sudden. Well, the author tries to explain it in a logical way but you have to be patient. The title. I find it shallow and misleading. A slot machine eats just one kind of food – your money. Also the titles of particular chapters were a bit too long and silly. I would prefer there were no titles at all, just numbers, but it’s only me. I found some surprising mistakes inside. When a woman who, allegedly, worked a long time for an exclusive boutique chain speaks about Christian Laboutin instead of Louboutin, it makes my eyebrows arch. I am not a fashion fan but even I’ve heard of this designer brand name and its fabulously uncomfortable but beautiful and rather expensive shoes. Another example – fung shui instead of feng shui. Did the editor take a nap? What’s more? Some expressions like “lickety-split” were repeated a bit too often. After a while it started to annoy me. I am also not a big fan of the cover art. Once again – it is not a book about gamblers so what does that one-handed bandit do there? 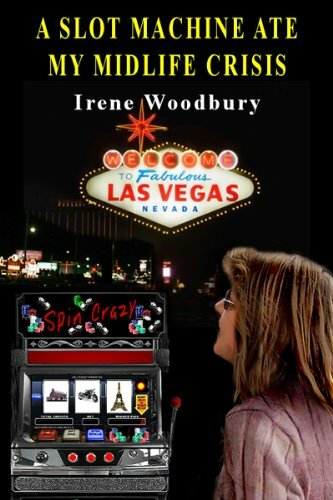 This entry was posted in Blodeuedd, book review, contemporary and tagged Irene Woodbury. Bookmark the permalink. This book really does sound like fun – and I loved the final quote! Thanks, Anachronist – you've brightened up my morning – I'm ready to face work now! You what's really fun? Romances set in Las Vegas! 😉It is indeed a very strange place…I am still in two minds about it, Tasha. It repells me and also fascinates up to a point. Tracy – the pleasure is mine! Have a great day! lolololol, I am always happy to oblige, my lady!